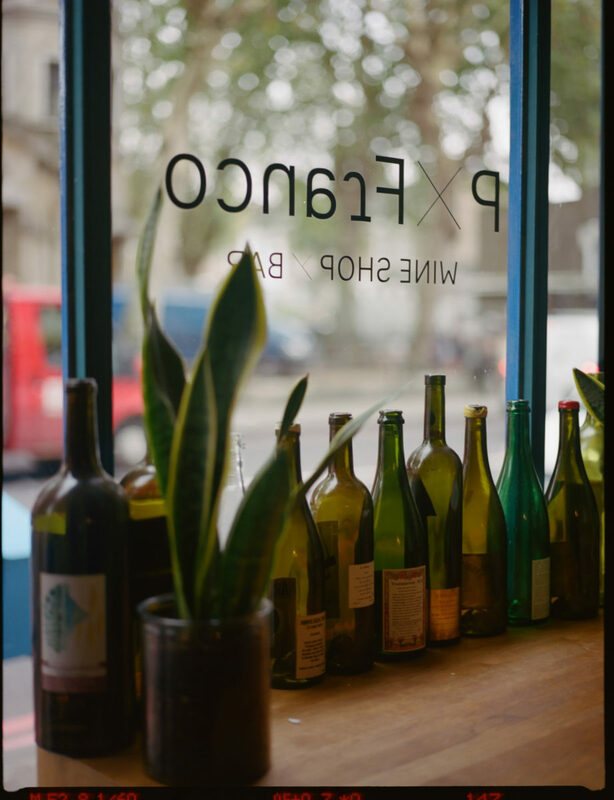 Housed in a former east London cash-and-carry, P. Franco was inspired by Parisian caves à manger, bars where you can buy wine to take away or drink in at a flat rate. The bar-come-shop originally offered only cheese and charcuterie for those wishing to stay awhile, however, their food offering has now expanded, with a rotation of exciting chefs cooking on simple dual hobs. “The first thing that anyone wrote about us was a local food blogger who said, “It’s a bit confusing at times who works there and who doesn’t.” That was fantastic because there are a lot of people that feel very comfortable here,” Phil Bracey, the man in charge, told us. Something Curated: Could you tell us a little about your background and how you entered this field? Phil Bracey: The place had been opened about two years before I came on board. I got into wine when I was working in bars, going through university in Sydney. I didn’t like the hours but enjoyed working with wine, so I went and worked in a wine shop. I finished university and used my degree for a year but began to hate it and I realised that I had fallen into it, and felt that I hadn’t really followed a passion. I randomly met a guy who asked me if I wanted to go and do harvest in Australia, to go work in a winery for a few months in McLaren Vale, and he convinced me to go with him. SC: What was the vision behind P. Franco? PB: I think Liam opened Noble Fine Liquor five years ago; we have the anniversary tomorrow actually. They wanted to open a shop like this because there was nothing really like this in London. 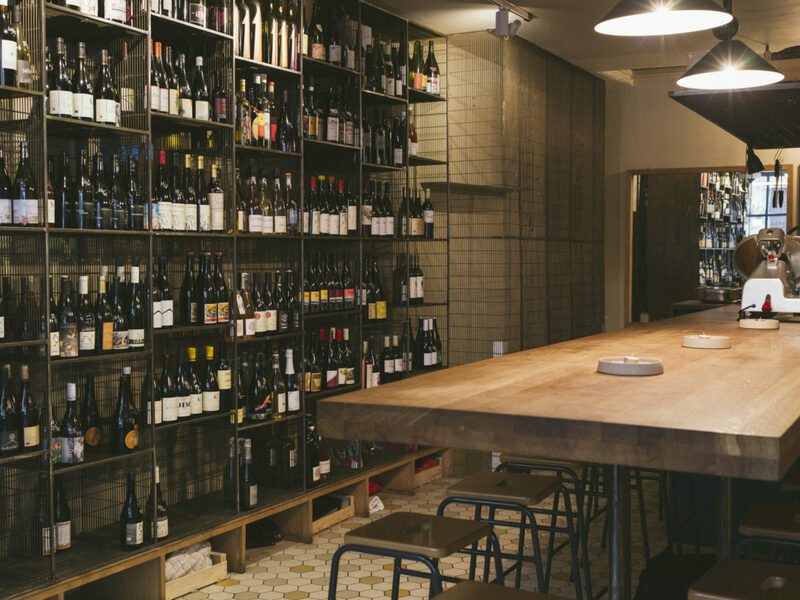 Even in Sydney it’s hard to get a shop that really doesn’t hold back in being all about minimal intervention, natural wine, whatever you want to call it. The words and labels aren’t perfect, but they are what we have. At P.Franco too, we are unapologetic about what we stock; we have 15 seats and it works well. The concept is you finish a bottle of wine and then you open something different. It’s never, this is our wine list and you’ve got your three reds and three whites each night, and if you come in and you don’t like any of them you can feel a little bit stuck. Here on an average week, we open about 60 different wines to serve by the glass. This wasn’t something that existed before that I’m aware of. SC: How did you come up with the name? PB: It’s a shortening of a Latin term for vines grown on their own rootstock; it’s spelled Piè Franco. In the mid 19th Century a small insect called phylloxera wiped out most of the vines in Europe and then vignerons got a lot of American rootstocks, planted them and then when they grew they grafted pre phylloxera cuttings back over these new vines. SC: You have a unique set-up of rotating chefs that cook here – what is the thinking behind this? And how do you choose the chefs you work with? All of the chefs we work with love and respect the wines that we do and that is first and foremost a consideration. It’s definitely had to do with being in east London too; I think it’s the driving force of this unique food and wine culture in London. We have Ed Wilson from Brawn cooking this weekend, and we’ve had people from the Clove Club, from Lyle’s, Magnus down at Legs, and it always seems to be this positive force. SC: Can you tell us about the wine selection in the shop? PB: Liam gave me complete control on the wines, and for me it starts from the ground up. In my mind, there are two ways of thinking about winemaking: you let the vineyard do the work and you work hard in the vineyard to create these beautiful grapes and then they will kind of guide themselves – you gently lead them in the direction they are already moving. And then there is the other approach of going, “I like this type of wine and in order to do that I need to pick really late, use this particular yeast strain, and I will add this amount of tartaric acid or tannin powder, or woodchips to get exactly what I’m looking for,” so instead of working from the ground up, you are working from the top down. I fell in love with wine because I liked the beauty of working from the ground up – I love the idea that you plant a seed and you can make people loose their minds and sometimes even spend stupid amounts of money. So the wines we work with have all of that in common. The way we choose our wines is that they all have to ideally have no chemicals in the vineyard, preferably using an organic or biodynamic viniculture, use local or ambient yeast and have no additions except, in some cases, for a very small amount of sulphur. It’s important to note, you can make an organic or biodynamic-based wine and still be one of the most boring, conventional, lifeless wines going. It’s like giving a terrible chef an amazing peach, and then they just freeze it or cook it through to a point where it’s like I could’ve given you any old fruit. SC: Do you have any current favourites in stock? PB: I literally just got back from Italy; I visited these guys in Lazio, Le Coste, that have vineyards on volcanic soils, mixing old and young vines but again no chemicals added and they can be challenging and amazing, which is a really good snapshot of what these natural wines can be. Natural wines can be fucked up and weird and wild or they can be really pure and mineral, clean and expressive. Whatever you like is great; I’m not going to say that because you like something that I don’t like that you’re wrong. I drink according to my mind-frame and that can change for many reasons, sometimes even a change in the weather. The Loire Valley is perfect for light reds that are really juicy easy drinking, which I love. The Auvergne is probably my favourite region but they don’t make as much wine as I would like. SC: Do you have any personal favourite wine and food pairings? PB: I have friends who are sommeliers and I never consider myself one. We don’t do pairings normally but people do ask, “What is the best thing that would go with this food?” So we have to be flexible in that sense. Quite often, picking light reds or a deep rose to go with steak tartare works nicely, and at the moment our Chef Peppe Belvedere has a wild mushroom tagliatelle on the menu and oxidized whites with mushrooms can be amazing. Pairing wine with the food of the region can be interesting as well. SC: What do you find is unique about London’s food and wine offering? PB: I was not expecting as much of a positive, backslapping, upbeat attitude that I see here in east London. Everyone is encouraging everybody else; I’m sure that does happen in Sydney, but I feel it’s a touch more competitive. I wasn’t prepared to see this positive attitude especially because Australian’s always think of the English as whingeing and whining, but everyone is really amazing and vibrant and there aren’t as many rules. East London feels more culturally diverse, which adds to that whole element of seeking out new things. 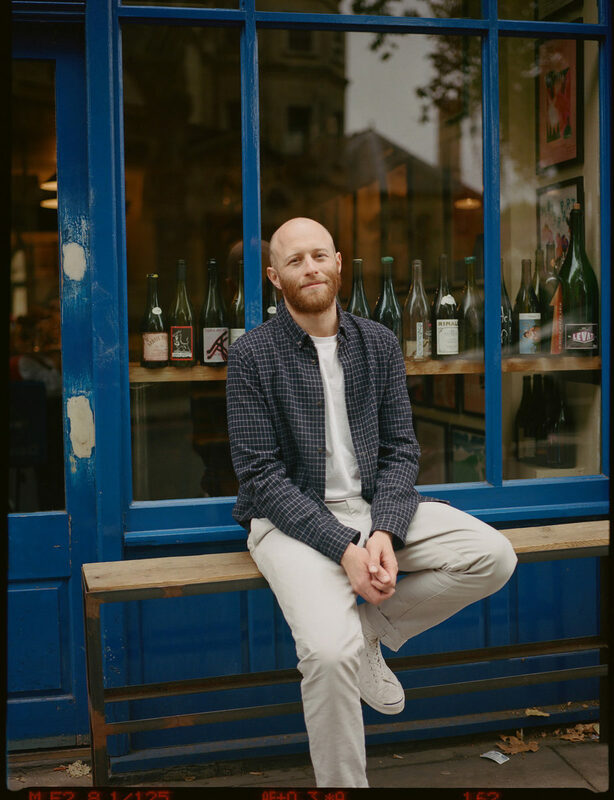 SC: There seems to be somewhat of a revolution happening, noticeably in London, with natural wine – why do you think that is? PB: Going back to the very basics of wine making, you didn’t have any of the things that make it ‘unnatural’, all the additives, all those manipulations weren’t possible and through the years, technology came about, and marketing came along, prizing consistency. Marketing has been hugely destructive. 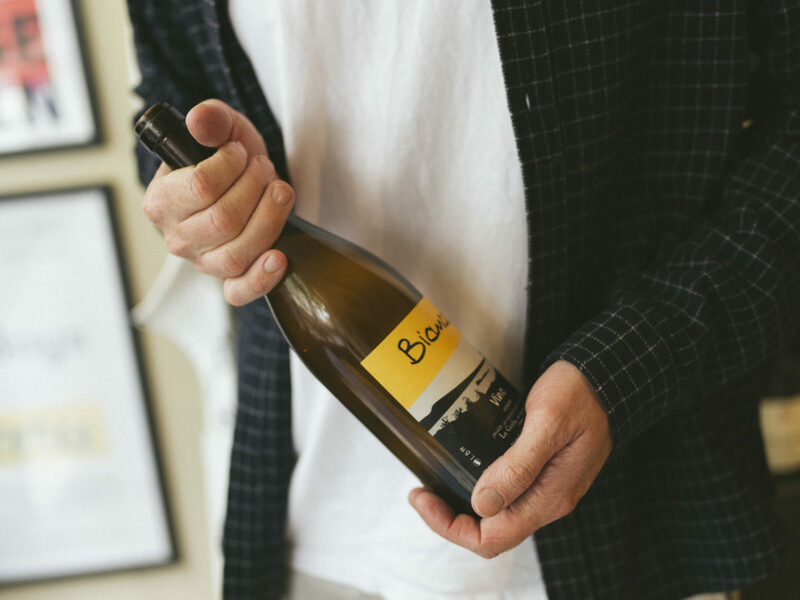 Natural wine’s popularity has just been a progression; I think breaking down the pretentiousness and changing people’s minds about where wines are from, as opposed to sticking with brands, has been a huge change. It’s been a long time coming in my opinion. 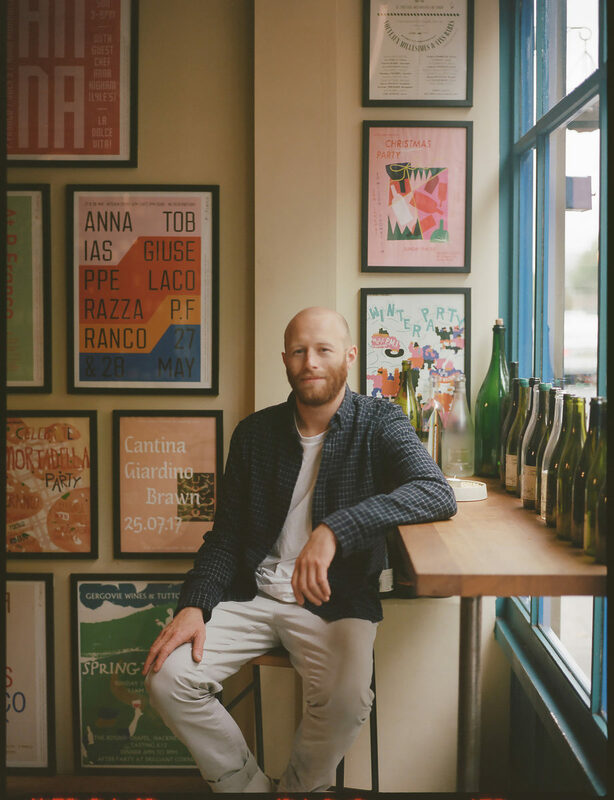 In London, the people that really pushed that, were the Terroir Group, Les Caves de Pyrene, they opened a restaurant Terroir with Ed Wilson who then did Brawn, which became the epicentre of natural wine and really broke down barriers here. SC: Can you explain the difference between natural wine, organic and biodynamic? PB: Organic and biodynamic are about the viniculture, the farming principles. Organic is what they don’t do in the vineyard – they don’t use synthetic chemicals. With biodynamic, they also do the following things: biodynamic preparations, with the idea that prevention is better than a cure, and working within the biodynamic calendar, so planting on particular days depending on the lunar cycle and using the water tables to determine how much it affects the plants intake of nutrients among other things. Those two terms have fairly defined parameters in which you need to operate. Overall the idea is to maximise soil health and microbial life and activity. Natural is an understanding that you are following at least one of those two farming principles and then once you’ve actually harvested the grapes you’re fermenting and aging the juice using wild yeasts, without additives. You can still farm using biodynamics and organics and add tartaric acid, chemical stabilizers, commercial yeasts, nutrients, tannin powder, and not even have to write these additions on the label but these wines feel and taste manipulated and lifeless in my opinion and lack honesty and transparency. SC: Are there any upcoming projects that you’re able to tell us about? PB: We’ve pretty much locked down the next chef but we don’t like to bring it up too much out of respect for the current chef. Apart from that there are always things in the works. I’m heading to Tokyo in January and am looking to do a P. Franco pop-up with Svante Forstorp formerly of Vivant Cave & Achille Paris. SC: Favourite places to eat and drink in London? PB: 40 Maltby Street in Bermondsey is probably my favourite wine bar in London. Also, Legs, Brawn, Lyle’s and Towpath Café next to the canal. PB: It’s always the place I haven’t been, so I guess it’s Tokyo – I’ve probably done ten hours of research and I’ve barely scratched the surface.